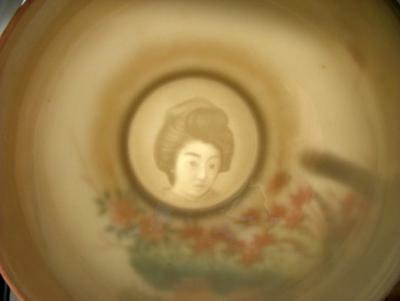 Japanese Tea Ware – Kutani Lithophane? A Japanese Teaware set that is probably Kutani Lithophane. A Set of Japanese Teaware that, when you are drinking and point the cups towards the light a Japanese women will appear at the bottom of the cup. It was given to my grandmother who is 86 years old today. It was given to her by my grandfather when he returned home from the second world war. Supposedly the set comes from Kobe, Japan and was hand crafted. It is all hand painted. I hold no sentimental value for it and I would like to get rid of it. However, I was wondering if it was worth anything? I purchased a cup and saucer with a Japanese lady’s face in the bottom of the tea cup. Price? £1. It would cost more for a packet of tea bags, so I don’t think I can sell it on for a fortune. That said, it is an unusual cup/saucer duo and one that I have only seen on two occasions whilst on my market ventures in the UK and Spain. The stamp mark on the saucer is of a crown, with 3 stars and leaves either side, initialed S.S. The plate and cup depicts bamboo, trees, house, mountains overlooking a Lake. I have an exact same set of 6 cups and saucers given to me when I was young over 50 years ago now, each cup has a different ladies face on the inside of the cup. Very beautiful but very delicate. I would be interested in the maker and value also. It is a beautiful set. you should be able to sell it. No value for something so beautiful. You must be a nut case. I am in the same situation – passed down, but no value only sentimental value to me. Is yours blue/gold dragon motif? Did you find out if it is worth anything? There is an auction site with the same style Japanese teaware up for bid starting at $50 with a placed value of $100 to $300, but there isn’t any activity/bids on it.